Gandhi Jayanti is a national holiday celebrated in India to mark the occasion of the birthday of Mahatma Gandhi, the "Father of the Nation". It is celebrated on October 2, every year. It is one of the three official declared National Holidays of India and is observed in all its states and union territories. The United Nations General Assembly announced on 15 June 2007 that it adopted a resolution which declared that October 2 will be celebrated as the International Day of Non-Violence. He is the man who played a significant role in achieving independence for India from the British Empire with his simplicity and strong will power. Mohandas Karamchand Gandhi, also known as 'Bapu' or 'Father of the nation', was born on the 2nd of October in 1869, in Porbunder, Gujarat. He studied law in U.K and practiced law in South Africa. But he left his profession and returned to India to join the Indian freedom struggle. He established the Satyagraha Ashram in Ahmedabad and the Sabarmati Ashram, which became a platform for introducing long-needed social reforms such as 'Harijan' welfare, small-scale industries and self-reliance and rehabilitation of lepers. Gandhi protested against the Rowlatt Bills and started a non-violent non-cooperation movement in India against the tyrant British rule. 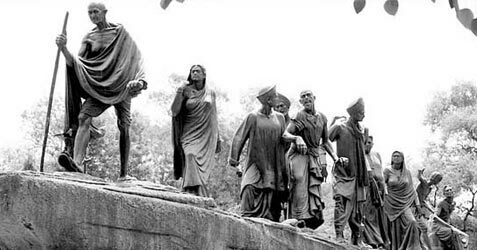 He violated the Salt Law by marching to Dandi (also known as 'Dandi March') in March 1930 and making salt and started the Civil Disobedience Movement in January 1932. In 1942, he nailed in the final nail in the grave of the British Government with his 'Quit India Movement'. He led his life that confirmed to his preaching. His morality and his doctrines on non-violence have become a beacon of light for the world. Five months after independence, Gandhiji was assassinated by Nathuram Godse while on his way to his daily prayer meeting. The 78-year-old Father of the Nation had left a country that was just discovering its feet, orphaned. 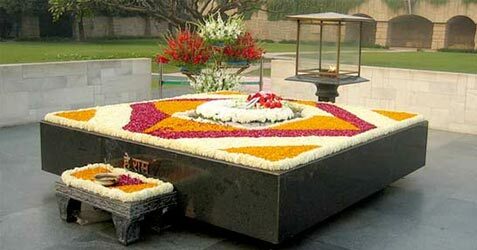 The day is marked by prayer services and tributes all over India, especially at Raj Ghat, Gandhi's memorial in New Delhi where he was cremated. On this special day, the President along with Prime Minister followed by other leaders pay homage to the Samadhi of Gandhi. All offices, colleges and schools remain closed all over the country. Special functions are organized in all the states of the country under the State Governments. Popular celebration includes prayer meetings, commemorative ceremonies in different cities by colleges, local government institutions and socio-political institutions. Painting and essay competitions are conducted and best awards are awarded for projects in schools and the community, on themes of glorifying peace, non-violence and Gandhi's effort in Indian Freedom Struggle. Usually, Gandhi's favourite devotional song, Raghupati Raghava Raja Ram is sung in memory of him. Sincere followers of Gandhi avoid meat and alcohol on this day. Mahatma Gandhi's contribution towards bringing peace and non-violence to this world is unparalleled. His teachings must be promoted to resolve current conflicts, avoid violence, and find peaceful solutions and to make our world a better place to live. Note: Neither we nor the puja organisers hold any responsibility on account of the accuracy of the content provided. we are not responsible for any inadvertent error that may have crept in the process of data aggregation. Kindly visit the respective website / puja website for latest information. This website contains consolidated links, puja and puja organisers information. We are constantly extending our support to viewers who may face difficulties in finding the detail of the respective puja / puja organisers. Kindly feel free to send us your queries and feedback by Clicking Here. © 2018 www.indianfestivaldiary.com | All Rights Reserved.